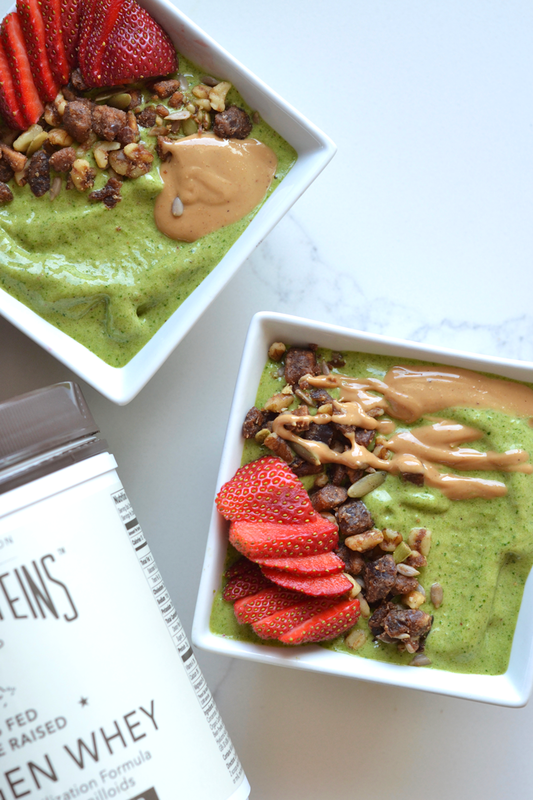 It’s about time I shared my favorite Vanilla Green Smoothie Bowl with you!! 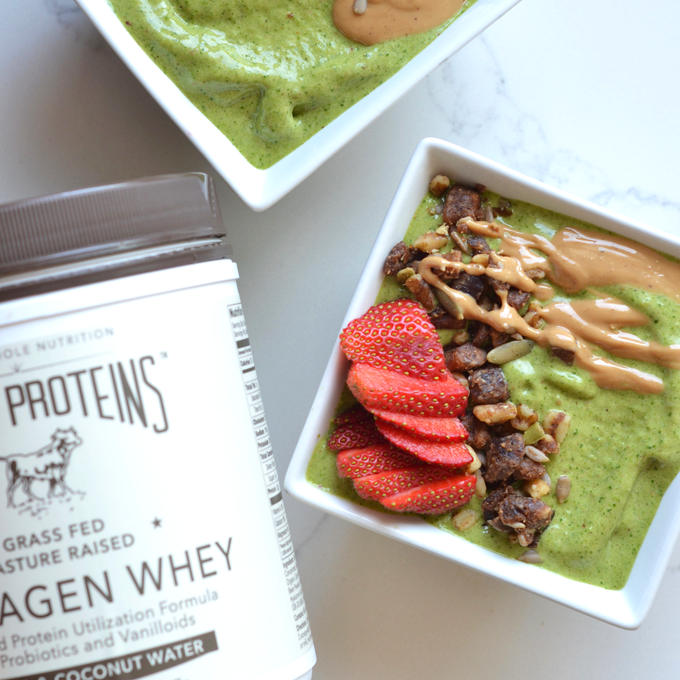 This has been our go to smoothie bowl recipe for years and it couldn’t be easier. I whip it up in our Cuisinart 9-Cup Food Processor which I absolutely love and use for balls and dips constantly, but if you have a high powdered blender that works great too. I have a blender that doesn’t work very well and I am on the market for a new one, but until then, my food processor will save the day! AND help to make this bowl super thick – which is key! The other key to a THICK and creamy smoothie bowl, is using just a little bit of liquid. You might start blending and think hmm this is WAY to thick and want to pour in more liquid, but be strong! It probably just needs to be stirred a few times and blended a lot more. You also never use ice in a smoothie bowl…. NEVER! It’s all about that frozen fruit! 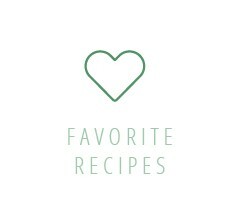 Now I made mine have a vanilla flavor 2 ways – FIRST: unsweetened vanilla almond milk! This is our liquid and I always make sure to have it on hand. 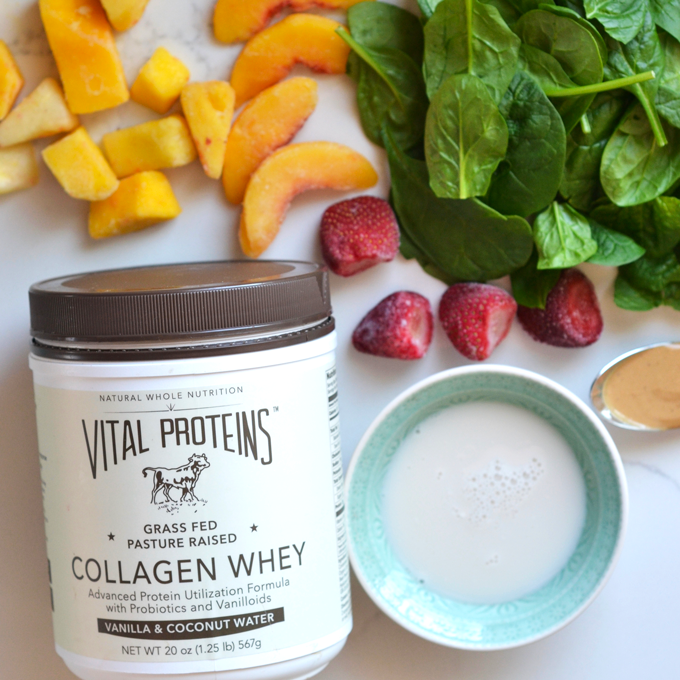 SECOND & most important: Vital Proteins Vanilla Collagen Whey! I always make sure to add some form of protein into my smoothies and smoothie bowls if it is a meal. The addition of protein to this sweet bowl of YUM is exactly what will keep you full and satiated until your next meal. You could also totally use Vital Proteins newer Vanilla Collagen if you want to keep it dairy free! I talked about this on Instagram this weekend but my body has actually been more okay with a little dairy once in awhile lately! After doing my Pinnertest (which I will share more about soon) I realized Cane Sugar is my biggest enemy, which is so great to know! 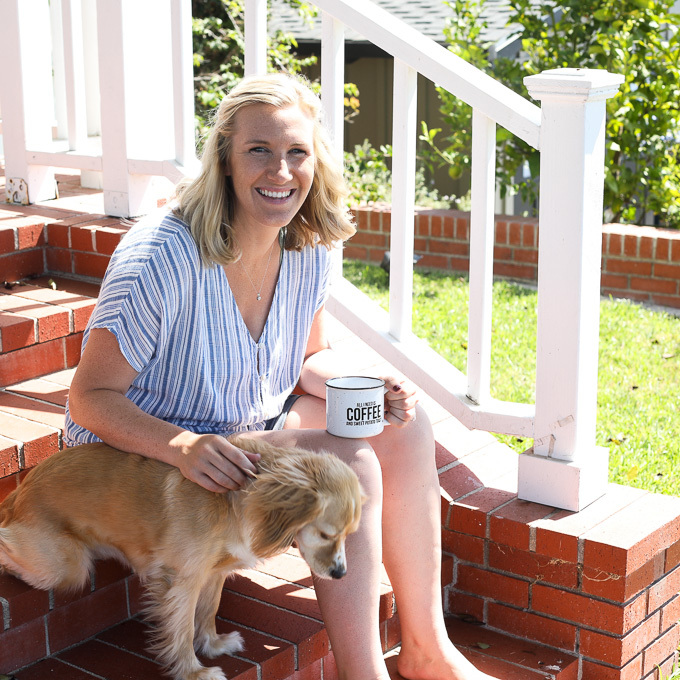 Their Vanilla Collagen Whey Protein Powder has 25 grams of proteins which combined with some cashew butter I threw in here makes it a protein packed way to start the day! The best part of my Vanilla Green Smoothie Bowl? THE TOPPINGS!!! This is where you can really have fun. 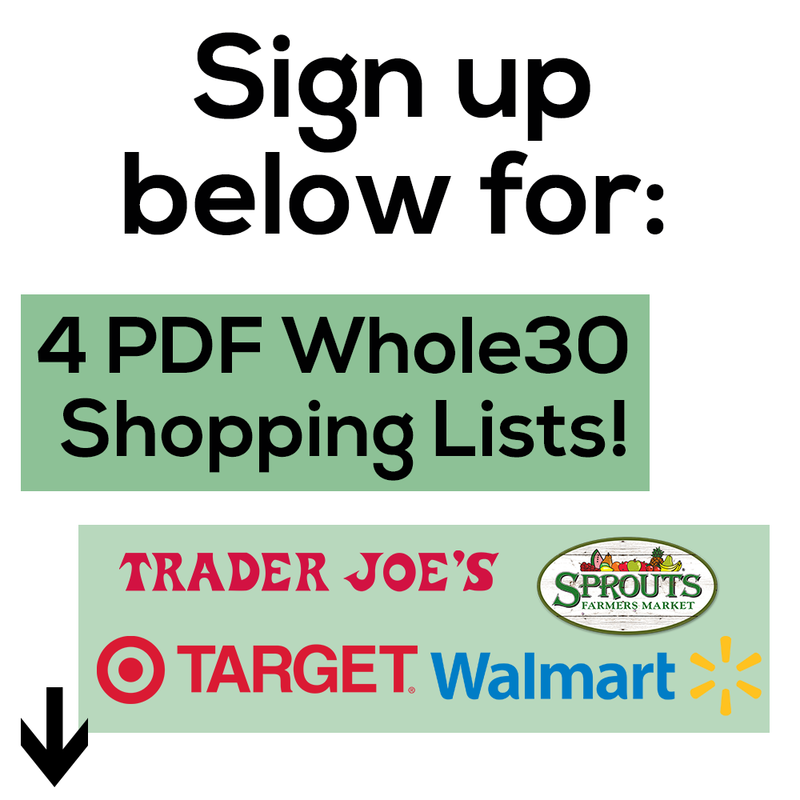 I have been loving the grainless granola from trader joes but you can find grain free granola all over the place these days. Then a little more beautiful fruit, a drizzle of nut butter and you are on your way to a beautiful instagram photo. The drizzle TOTALLY makes it! 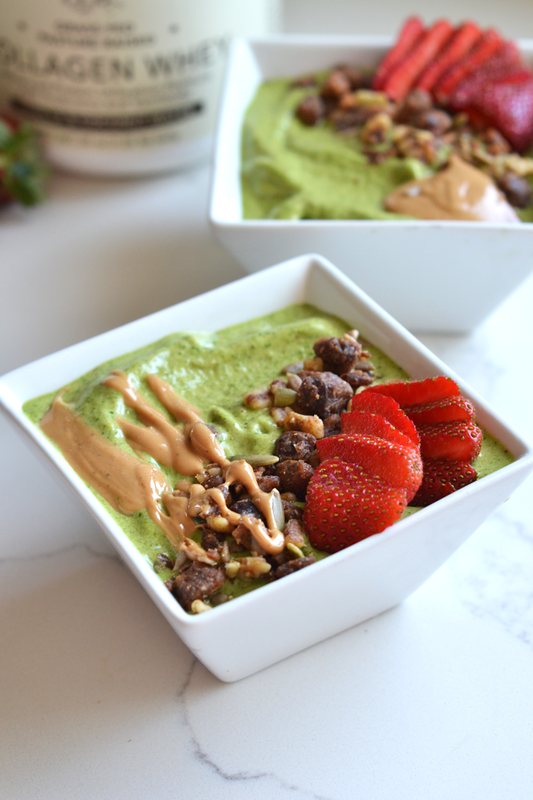 Pin this Vanilla Green Smoothie Bowl for later! This post is sponsored by Vital Proteins! I was compensated and all opinions are 100% my own. Thank you so much for supporting Little Bits Of! Combine all ingredients in a food processor or high powdered blender. Blend on high until thick and creamy. 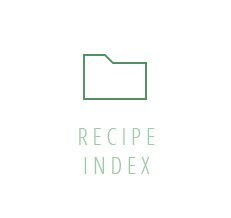 If it is too thick, add 1 tablespoon more almond milk until desired consistency is reached. The thicker the better!